The process of tie-dying involves twisting and tying off fabric before applying different colors of fabric dye. Making tie dye shirts or other items is an enjoyable craft to participate in for both children and adults. Since fabric dye is being added to the fabric it's important to make sure you set the dye so the colors don't end up running and bleeding. Once the colors are set, they will stay put and you won't have to worry about color transfer stains on your other clothes. 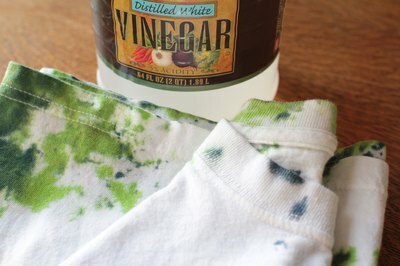 Place your tie-dyed products in a bucket and pour white vinegar over the items to cover them. Soak the tie-dye items for 15 minutes to help set the fabric dye colors. 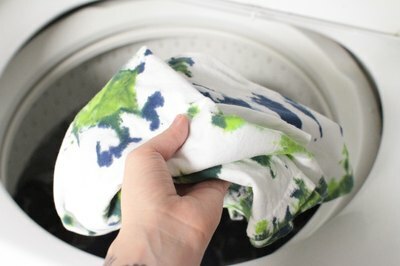 Remove your tie dye items from the bucket and place them in the washing machine. Fill the washing machine with cool water. Add your laundry detergent and 1/2 cup of table salt to the wash water. Salt further sets the fabric dye to prevent color bleed. Wash tie dye clothing separately from other clothing the first time you wash it. 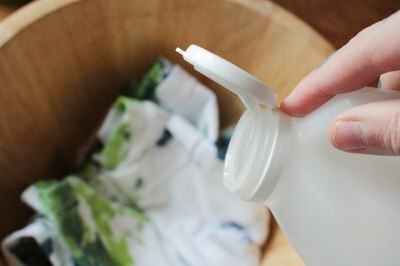 Add 1 cup of vinegar to the wash water to maintain colorfastness. Hang dry your tie dye items to help keep colors bright. Wash tie dye clothing with color safe bleach, which brightens colors.